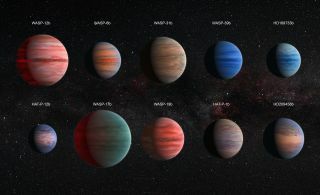 An artist's impression of 10 hot Jupiter worlds featured in the largest spectroscopic catalogue of exoplanet atmospheres to scale with one another. The cloudy atmospheres of such planets may hide signals of water, scientists say. Cloudy skies on sweltering Jupiter-size worlds seem to be hiding signs of water from curious eyes. A recent survey of alien planets, known as "hot Jupiters," reveals that a large number of them without strong signs of water contain clouds and hazes that may block measurements of water deeper within the atmosphere, solving a puzzle that has plagued astronomers for some time. "The alternative theory to this is that planets form in an atmosphere deprived of water, but this would require us to completely rethink our current theories of how planets are born." About 1 percent of the exoplanets found to date are hot Jupiters, massive gas giants that orbit their star in just days or even hours. NASA's Hubble Space Telescope has been able to study only a handful of the atmospheres of these worlds because most are lost in the bright light streaming from their parent star. Initial examinations of these worlds showed that, while some contained strong signs of water in their atmosphere, others appeared to have little or none, making them "dry." Sing and his colleagues used multiple observations by Hubble and NASA's Spitzer space telescope to study a collection of 10 hot-Jupiter atmospheres across an unprecedented range of wavelengths, creating the largest-ever spectroscopic catalog of exoplanet atmospheres. Before the study, examinations of exoplanet atmospheres have been limited to visible light. The team found that dry worlds with faint water signals also contained clouds and hazes, while those with strong signs of water appeared cloud-free. This suggested that all of the worlds contained similar amounts of water, which formed through similar means, rather than some of them having water somehow removed from them early in their lifetimes. "I'm really excited to finally see this wide group of planets together, as this is the first time we've had sufficient wavelength coverage to compare multiple features from one planet to another," Sing said in the statement. "We found the planetary atmospheres to be much more diverse than we expected." Hot Jupiters reach extremely high temperatures, so their clouds aren't made up of water such as those found on Earth. According to Fortney, they could instead be composed of materials like droplets of liquid iron. "These are exotic clouds on exotic planets," he said. While hot Jupiters are too sweltering for life as we know it to evolve, understanding their composition shines light on how they, and other planets, form. To study atmospheres on other worlds, astronomers must focus on planets that pass between Earth and their parent star. As they move along this path, known as a transit, light from the star passes through the planets' atmospheres, allowing scientists to identify signals from various elements and molecules, and determine between cloudy and clear worlds. "The atmosphere leaves its unique fingerprint on the starlight, which we can study when the light reaches us," said Hannah Wakeford, of NASA Goddard Space Flight Center. Only a handful of measurements of exoplanet atmospheres have been taken by Hubble. The satellite's successor, the James Webb Space Telescope, will allow astronomers to study the atmospheres of worlds beyond the solar system in the infrared after it launches in 2018. The results were published online Monday (Dec. 14) in the journal Nature.